Building New Habits for an Awesome New Year!!!! A new year means new goals and resolutions! Everywhere I look people are sharing their hopes and aspirations for the coming year and that excitement and enthusiasm is inspiring. It can also feel daunting, especially for those of us who aren’t sure what we want for this year, or who aren’t sure how to go about reaching our goals. 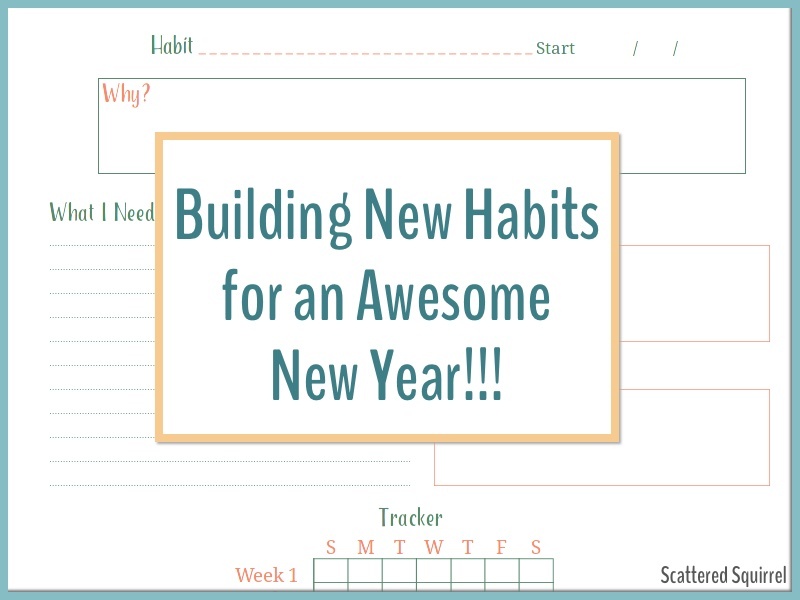 I’ve been giving this a lot of thought over the last couple of months, and I really think that the key to reaching some of our new year’s goals is through building new habits that will get us from here to there. Building New Habits Will Help Us Achieve Our Goals!! Many of the personal goals we set for ourselves center around concepts and ideas that are about building new or better habits into our lives. The list could go on and on. Though the resolutions or goals might differ, one thing stays the same – changing or creating some of our habits will go a long way to helping us achieve our goals. Take a moment and think about the habits you already have. Not your routines, just your habits. The things you do that you don’t even think about. Rinsing your coffee cup as soon as you’re done with it. Brushing your teeth before you go to bed. Tidying your bathroom after you get ready in the morning. Hitting the gym on the way to work or after dropping off the kids. You might need to ask someone close to you to help you with this, because often times our habits aren’t clear to us. We don’t consciously think about them. Half the time we do them and don’t even realize we have. It is this auto-pilot quality that makes our habits work so well for us. Or not so well, depending on the habit. To help us reach our goals we want to focus on the good habits. The less we have to think before we act, the easier things can become. If we can build habits that help move us towards our goals, eventually we’ll be working towards our goals without even thinking about it. Which in turn will free up space in our brains for new ideas or even just allow us to relax a little more. Small habits can affect great results, and can work with any goal you set. For example, one of my goals last year was to be more organized with how I handled information and ideas for both my personal and work life areas. I was losing track of things, my planners were starting to get overfull and not very functional, and there was paper everywhere. When creating my plan of attack to reach this goal, I quickly realized that I needed to be more intentional about where I was writing down notes. I sat down and tried to figure out how I could create a system that worked better. The problem wasn’t what I was doing, it was how I was doing it. I’d already built up one habit – writing things down. Now I needed to get in the habit of writing these things in one place. When I first started, it was annoying having to remind myself where to write something down. It took a few weeks for it to not feel like a chore to take that extra step. In a few more weeks it was feeling more natural. A few more weeks after that and I was not longer thinking about it. Now, not only is this a habit, but it’s also an integral part of my organization and planning systems. It’s hard to imagine having ever done it any differently. It sounds like such a small thing, but it’s made a HUGE impact in helping me reach that original goal of being more organized with our information and ideas. With a little planning and a way to track our progress, we can help make the work of building our new habit a little bit easier. 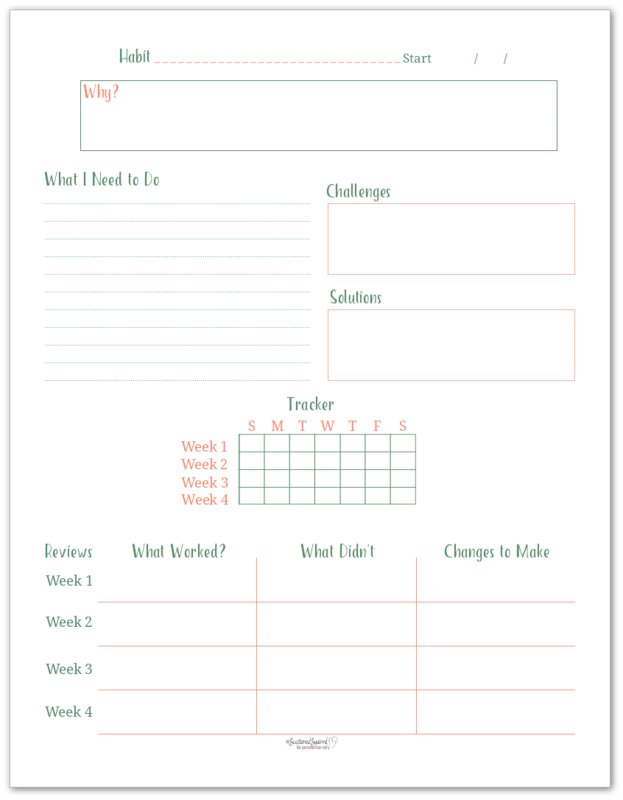 I use a habit building worksheet/tracker to help me. I’ve been using it for a little while now, and I thought the beginning of a new year was a great time to share it with all of you. 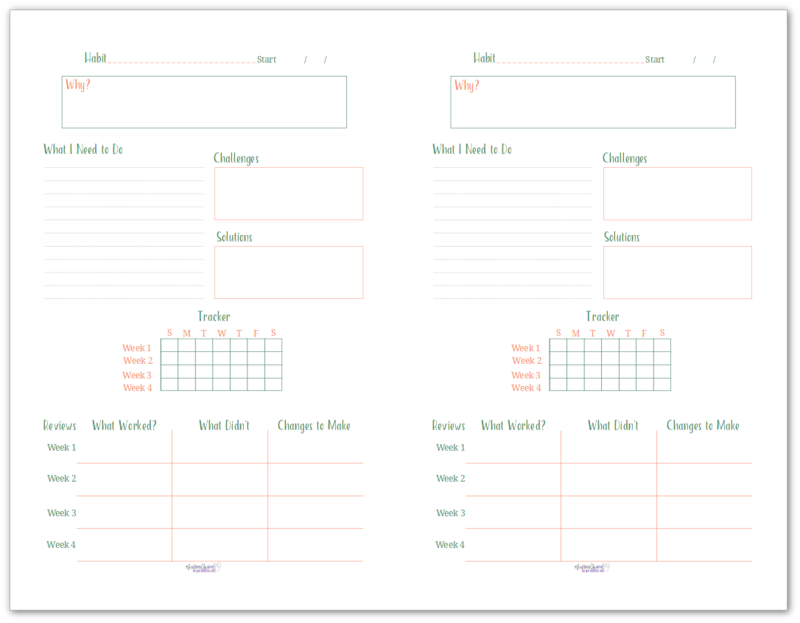 There is space at the stop of the worksheet to give your habit a name or short description so you know what’s it’s for. Following that is a section to define the purpose or reasons you’re creating this new habit. Now you can plan what you need to do to make this habit a success. Taking the time for this step before you start, allows you to not have to think about it when it comes time to actually doing it. Just check the worksheet before you start. Identify any challenges you think you might encounter while building this habit. Then brainstorm some solutions so you’re prepared for when it happens.. Roadblocks and hiccups are going to happen. We can’t really avoid them all the time, but we can try to plan ahead and try to come up with a way to work with or around them. For me, not always having my notebook on hand was one challenge. My solution was to use was to use sticky notes if I needed to, and then put the sticky note in the notebook as soon as I could. Now it’s time to simply get started. Use the tracker section to monitor your progress. At the end of each week sit down and review how you doing in your habit building effort. Look at what’s working well and what’s not. Then make tweaks and changes so you can do even better next week. Again, to use my notes as an example, after the first week I realized that having one place to write everything down was NOT going work. Our old house was two levels, and my office was upstairs while the homeschool and family areas were downstairs. I tried carrying a notebook around but I inevitably would forget it somewhere. With this in mind, I ended up creating a notes section in all my planners and I dedicated a lined notebook to act as a catch all for random thoughts. I almost always had one of those items near me, and so I started focusing on making sure notes and thoughts started getting put in those designated areas. Once I made that change, it became so much easier to stay on top of. Continue to track your progress and make changes as needed. They say it takes anywhere from 21 to 28 days to build a new habit. I say take as long you need to make it stick. Personally, it took me about two months before my new note taking system became something I didn’t really have to think about. I kept tracking and reviewing until I reached the point where there was nothing left to tweak. Then it took a few more weeks before I stopped tracking it. The way I see it, once something becomes a habit, or becomes second nature to us, we no longer need to keep track of it. THAT is the beauty of building new habits that are designed to help us reach our goals. We can stop actively thinking about them and focus on other things that need our attention more, while still working towards that goal. 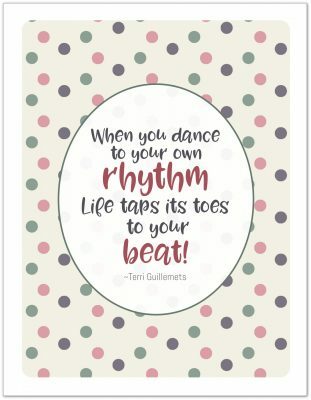 As always, to snag a copy of any of the printables here on Scattered Squirrel, simply click the picture of the one you would like. Are you building new habits or routines this year? Do you have a goal or resolution you’re working towards that could be made easier with some new habits? I’d love to hear your thoughts. Drop me a line in the comments below and let me know. For personal content, I love using paper and pen. Finding templates that incorporate best business practice for personal use that are practical, logical, attractive, core content driven and easy to file and importantly retrieve. You are very welcome Nicole. I’m a paper and pen girl too. I don’t mind digital for some things, but if I don’t write it down by hand, I’m more likely to forget it. 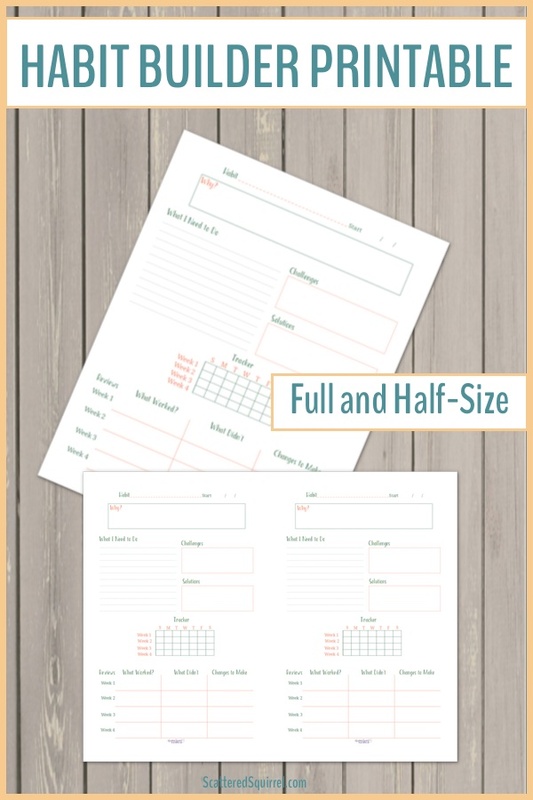 I’m happy that you like the printables and that they’ll come in handy for you. I want to be a recovering clutter-bug. I am starting over as of right now! Your planners I decided are going to be my keys to success! Just one day at a time, I hope I hope I hope to feel better about my life, I have been in a rut and I want out of this living mess that i created with my clutterness. I completely understand those feeling Jewel. I’ve been feeling the same way these last few months and am trying to pull myself out of it day by day, step by step. I hope that you find some printables to help you on your journey and I hope that you know that you are not alone in this journey. I don’t now if you like Facebook groups or not, but there is a group called 365 Items in 365 Days that is a wonderful group. Everyone in it is very supportive and understanding and working towards decluttering too. If you feel like having some people to talk to who understand and won’t judge is something that will help, I encourage you to check it out. My friend Hilda runs it, and she’s always full of wonderful and helpful advice.